This week's challenge is a Sketch Challenge - any stamps, any color, but to try and use this layout as a guide for our artwork. 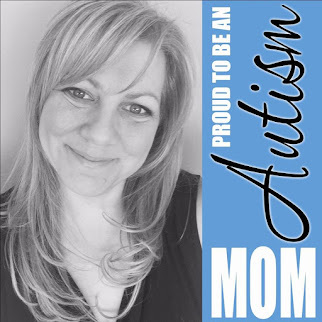 However, do you believe I misplaced one of my Labels Collection framelits, so I altered a little, missing a layer, and put the ribbon underneath the panel vs. on top. But I think you'll still enjoy it! Today I'm featuring the beautiful Butterfly Basics stamp set and the Blender Pen technique! Here's the full picture and a close up of the Blender Pen watercoloring and to show the panel is raised using Stampin' Dimensionals. I stamped the images in Staz-On black even though I wasn't going to use an Aqua Painter, but playing it safe with the Blender Pen technique and my favorite way to water color! I stayed with black and white so the color of the flowers would really pop and be the focal point. The main, rasied focal point is raised using Stampin' Dimensionals and was cut with the Labels Collection framelits. LOVE them, such a beautiful, elegant shape. 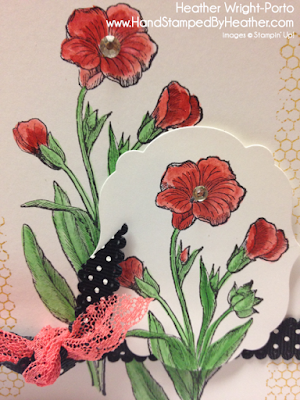 [Retired] Stampin' Up! black and white ribbon I have - I have to order new black! Sorry! If you're loving the Blender Pen technique and want to learn more, see more.... We loaded a bunch of One Sheet Wonders and Blender Pen technique video this past week in Stamping and Blogging! oh, how absolutely lovely this is, you did a fabulous job coloring the flowers Heather. So pretty Heather! 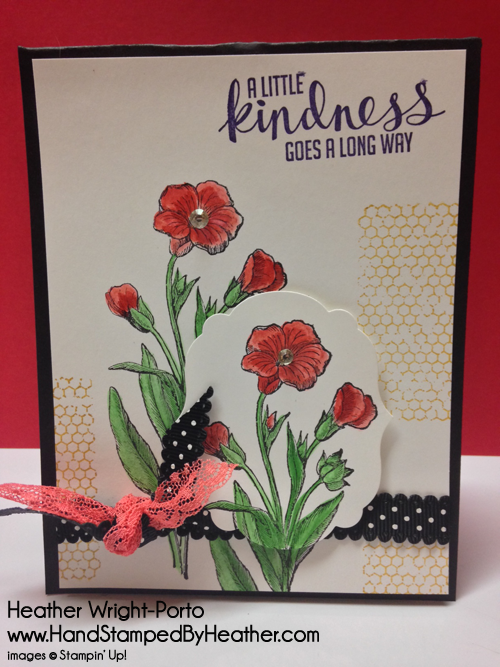 Love the little die cut flower layer, perfect with the sketch! Beautiful card Heather, I love that stamp set and you just inspired me to go stamp with it today. Love the color combo, striking. Love how you spotlighted on the label layer. Beautiful card! TFS. I think you are having fun and it shows. Love what you created here. The ribbon rocks. Hugs from Shelagh.